I do not keep then in stock, non do I have a list anymore. I will offer them for sale as I get them. First come, first served. Any pm asking "Do I still sell them" will be ignored. Thank you. I'm offering rear disc brakes to convert your Jeeps drums to disc's on a Dana 35 (will fit the c clip & non c clip model) 44, & Chrysler 8.25. I will ship you everything you need to complete the conversion-minus rotors, usable E-brake shoes (shipped as cores) & possibly good pads. If you own a '97+ you can opt for a driver side E-brake cable for $10. I do not offer a passenger side E-brake cable. For the passenger side cable you can get one for a Liberty. For the '96 down you will not receive any e brake cables. You can reuse your cables if you have a small lift on any year XJ. All you need are 2 small cable clamps. Route the end around the actuator arm & clamp it. Or you can get new cables here. With the Dana 44 you will need to get a set of bearing retainer plates. You will also need to redrill the holes in the backing plates to match the 44 housing mounting holes. On the Dana 44 & Chrysler 8.25 you will need to enlarge the opening so it will slide over the axle tube. With the c clip Dana 35 this is a direct bolt on. $225 for a Liberty/Chrysler 8.25 kit shipped in the lower 48 states. Again, '97 & newer will need to add $10 if you want a drivers side e brake cable. This is a idea of what you will be receiving, not pictured is the parts that go into the porportoning valve, which is included in the kit. To get parts, go to the store & tell them you have a '96,'97,or '98 ZJ (pick one) with rear disc's & then tell them the parts you need. Sweet, just checking all parts are from same vehicle. Thanks. I bought his last set, and was happily surprised that absolutely EVERYTHING came in the box. also showed up in a reasonable time as well. would def do business with him again, so no worries. also as far as the pricing goes this is a super good deal. any questions about the kit you can check my VVV build thread VVV as I put up a bunch of pics. You are one of several people who have bought one of my kits. 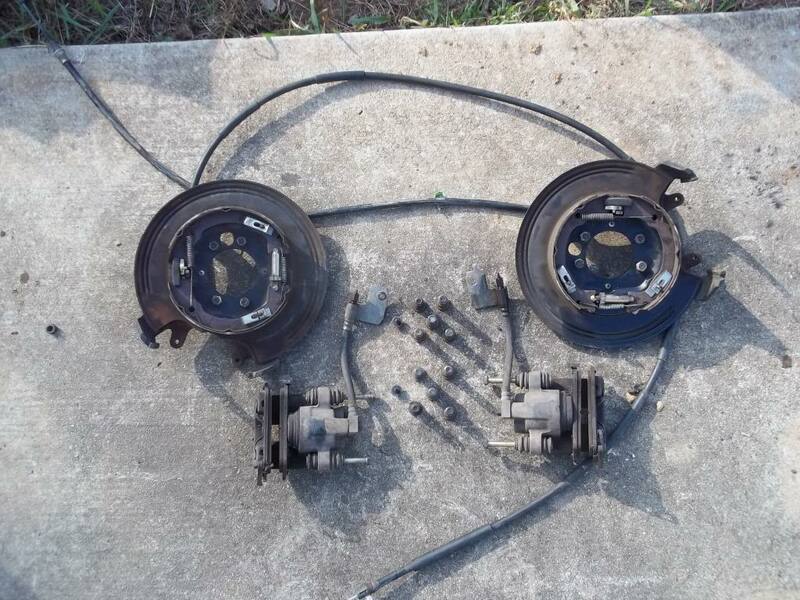 I took the kit out of the hatch today & noticed it has a good set of E-brake shoes.You will only need to get rotors.Ebay had them for $20 each shipped & parts stores have them for $25 each. Usually the shoes turn to dust when they sit.I have yet to figure out why. I have a set of rear disc brakes to convert your drums to disc's on a Dana 35,44, & Chrysler 8.25. I will ship you everything you need to complete the conversion-minus rotors & E-brake shoes. With the Dana 44 you will need to get a set of bearing retainer plates.Last time I checked,Amazon had them for $7.You can also get them from the dealership.They are the same ones the Rubicons use. With the Dana 35 this is a direct bolt on. This is a idea of what you will be recieving but this is a old set I have already sold. The only thing not pictured is the parts for the porportoning valve. The answer is in the third sentence. The XJ Dana 44 is kind of a rare bird,so I wouldn't ship everyone a set of spacers.Besides,I like the Rubicon bearing retainer better.It's a Jeep part & has the spacer built in. I may start stocking the Rubi plates. Yes,I am still selling the kits but currently I am out of stock.I will get more on Feb. 9. Let me know if you would like a set.